class="page-template page-template-page-sections page-template-page-sections-php page page-id-876 samba_theme wpb-js-composer js-comp-ver-4.1 vc_responsive"
At QCF Bournemouth, we understand a thing or two about carpets and flooring – after all, it’s what we’ve been doing for over 40 years. 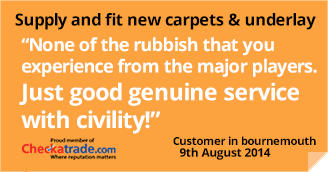 But we also know that your carpet and flooring should reach you in perfect condition, ready to be installed by our expert fitters, in your home or office. We understand that you will probably have old carpet you want to get rid of safely and in an environmentally-friendly way. That’s why we offer FREE local delivery of all your purchases and we can dispose of your old flooring for you. The disposal service is chargeable, but isn’t it nice to know that all the rubbish will be taken care of? Once your new carpet is laid, all you you have to do is enjoy it!